Back in April and May I wrote a whole series of posts about how the Right was systematically trumping-up a controversy over the Department of Homeland Security Report, “Rightwing Extremism: Current Economic and Political Climate Fueling Resurgence in Radicalization and Recruitment” [PDF,]” which eventually led the DHS to pull the report. Now, in light of the murder of Dr. George Tiller and the recent shooting at the Holocaust Museum, we’re seeing a variety of pieces claiming that these events validate the report’s warnings. And undoubtedly they do, but the irony here is that this report was never about run-of-the-mill conservatives or right-wing political groups – it was focused on violent, racist, anti-Semitic, and anti-government extremists – but it was the conservatives and right-wing political groups who made it about them…The report was not a warning about mainstream conservative political groups or lawful anti-abortion activists or religious organizations – it was a report about violent, radical extremists. But it was the Right that intentionally conflated the two and now, in the wake of two high-profile violent acts carried out by right-wing extremists, it is the Right that is insisting that they have nothing in common with such people…. 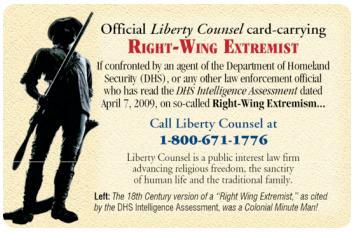 Kyle also draws attention to the above ID Card, available from the Christian fundamentalist Liberty Counsel. Is there any doubt that Fox News is playing an increasingly erratic and dangerous game by embracing the type of paranoid insurrection rhetoric that people like Pittsburgh cop killer Richard Poplawski are now acting on? By stoking dark fears about the ominous ruins that await an Obama America, by ratcheting up irresponsible back-to-the-wall scenarios, Fox News has waded into a territory that no other national news organization has ever dared to exploit. The hate seems to be at fever-pitch: Max Blumenthal’s video of well-educated young American Jews in Jerusalem spouting extremely crude racism and opining that Obama should be shot is one particularly shocking piece of evidence. Apocalyptic aggression is fueled by right-wing pundits who demonize scapegoated groups and individuals in our society, implying that it is urgent to stop them from wrecking the nation. Some angry people in their audience already believe conspiracy theories in which the same scapegoats are portrayed as subversive, destructive, or evil. Add in aggressive apocalyptic ideas that suggest time is running out and quick action mandatory and you have a perfect storm of mobilized resentment threatening to rain bigotry and violence across the United States. …hateful e-mails that are forwarded to me attacking other Christians, the President, and a plethora of other things. Most are Urban Legends that have not been checked, but they still get sent. Will we see some moderation now that people are getting killed? Or will we simply hear more complaints that joining the dots between paranoia and violence is simply about smearing innocent conservatives? Now isn’t this fascinating. James von Brunn, the white-supremacist suspect in today’s Holocaust Memorial Museum shooting in which the guard who was shot has now tragically died, describes the relevance of evolution to his sick thinking. …No, he doesn’t cite Darwin by name in the part of his book that’s readable online — the first 6 of 12 chapters. But do you get the general drift? And you want to tell me that ideas don’t have consequences? …Mr. Von Brunn has been on this planet for 89 years, and he didn’t feel comfortable shooting up a Holocaust museum until now–this new era of “tolerance,” in which we must tolerate the most extremist Muslim behaviors and sentiments. Our new president did not tell a virulent anti-Semite to travel to the U.S. Holocaust Memorial Museum in Washington to kill Jews, but he is most certainly creating a climate of hate against us. …Just days ago Obama traveled to Cairo, Egypt. It was his second trip in a short time to visit Muslim countries. He sent a clear message by not visiting Israel.